As someone who equates Super Bowl Sunday more with wings, beer, and commercials than I do actual football, there's one part of the day's festivities that's a clear favorite. The Super Bowl halftime show is spectacle at its finest. 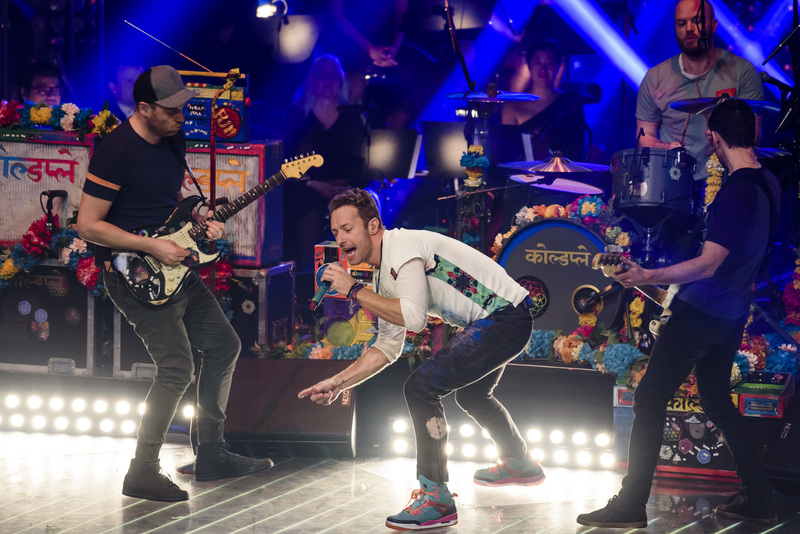 This year, Brit pop radio rulers Coldplay will be headlining the halftime show. Chris Martin and the guys are also making room for famous friends (and past headliners) Beyoncé and Bruno Mars to do their thing on stage at Levi's Stadium in Santa Clara, California. And the rumor mill is working over time to predict the other performers who might join them. Like pretty much everyone who's into pop music, I'm dying to know if Adele, The Weeknd, or Rihanna might might be planning to show up, but I'd also love to be actually surprised this Sunday. Of course, there's only one sure way not to be spoiled on any surprise guests, and that's watching the mini-concert live. Won't be near a TV or have basic cable? You can stream the Super Bowl halftime show this year and not miss a second of what's sure to be a loud and lavish production. The Super Bowl celebrates its 50th anniversary this Sunday, but its media partners are keeping up with the times. Viewers have so many new options in regards to how they consume television in 2016, but sports are usually lagging in terms of non-broadcast options. But to accommodate its 21st-century audience, CBS Sports will be streaming the halftime show and the rest of the game on CBSSports.com, which you can also access on a tablet or any Internet-enabled device that has the CBS Sports app. Here's why that's such an awesome move. Come Sunday evening, anyone can log onto CBSSports.com and stream the full Super Bowl broadcast for free. No trial month, no fees, no nothing. Totally free. The halftime show is included, of course. If you're like me and feel cold to lukewarm about football, you can leave the game on mute until the lights dim, the music kicks in, and the real show starts. Use a Roku box or another streaming device to get your entertainment? Add the CBS Sports app to your home screen right now so you'll be ready by game night. Besides Roku, the app is also optimized for AppleTV, XBOX One and Windows 10. So if you'd prefer to see Beyoncé strutting in glorious HD on your TV screen instead of your laptop, this is the way to go. Unlucky souls who have work or life conflicts on Sunday and can't be planted in front of a device, I got you too. A possible solution: sneak off to the break room, open the NFL app (not CBS Sports this time), and you won't miss a second of the slay. Unfortunately for other mobile customers, the NFL app will only be streaming the game and the halftime show for Verizon subscribers. And if all else fails, you know that the Coldplay, Beyoncé, and Bruno Mars halftime performance will be the talk of the Internet for weeks, so it shouldn't be too hard to find the highlights.